"Captured" was a temporary installation realised in May 2011 by machine artist Nils Völker and graphic designer Sven Völker at MADE Space in Berlin. 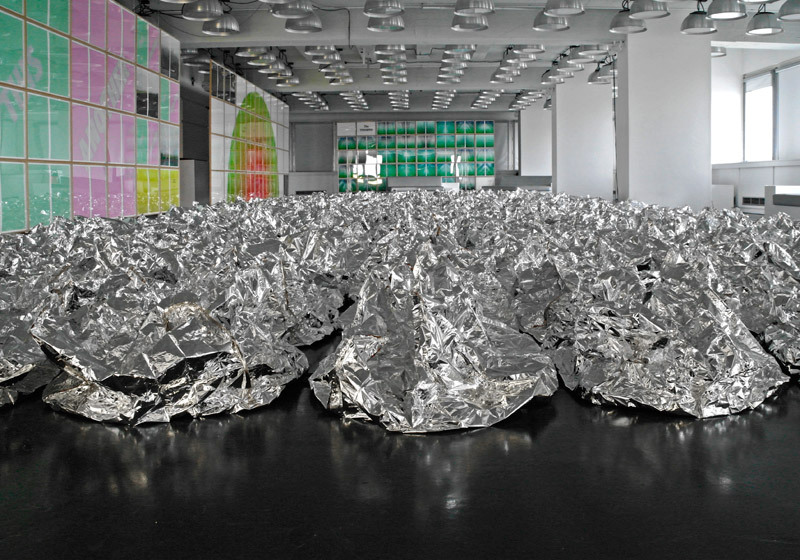 Four hanging walls with 304 framed graphic pages surrounded a field of 252 inflatable silver cushions. Both artworks related to the theme of light and air and interacted with each other in a twelve minute performance that also included sound and light. Sven Völkers graphic work were his so called "books on walls" and narrated the installations four chapters of the intangible, the volume, the border and the ephemeral. Nils Völkers custom made inflatable air bags were programed by the artist to create sequences according to the chapters. He also controlled the existing multi-colour light system to intensify the dramaturgy and to create a close relationship between all elements. During three months of working inside the space and in close collaboration with the MADE team, the two brothers combined physical computing and graphic design, into a new artwork, a mixture of stage setting, performance, installation and exhibition.